Omega visited me in my office today and shared a choral recitation of a Thanksgiving poem, so I thought I'd share it with you. It will surely put you in a Thanksgiving mood. Happy Thanksgiving. Taft, Hotchkiss, and Andover were all well represented yesterday at Saint David's. 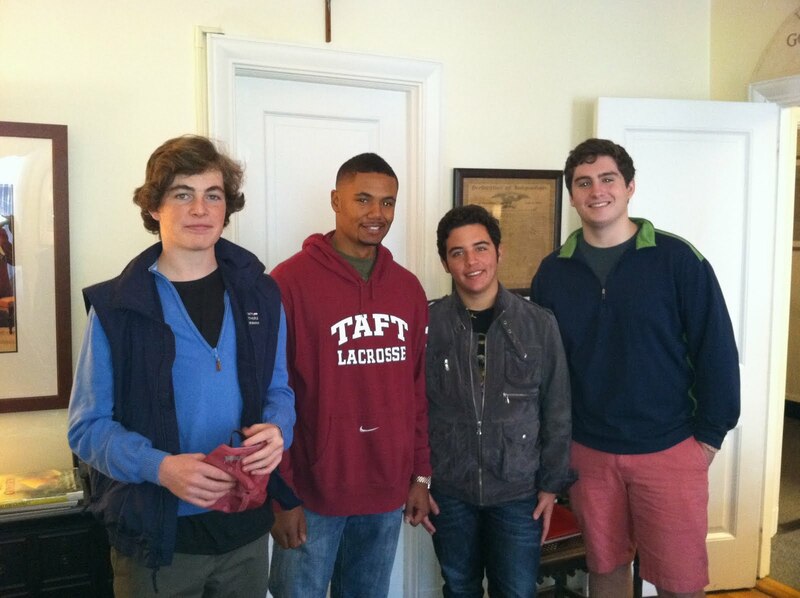 Brophy, '10 from Hotchkiss, Mark, '08, Danillo, '10, and Hugh, '08 all from Taft and Chris, '11, from Andover (second photo) all stopped by to catch up. 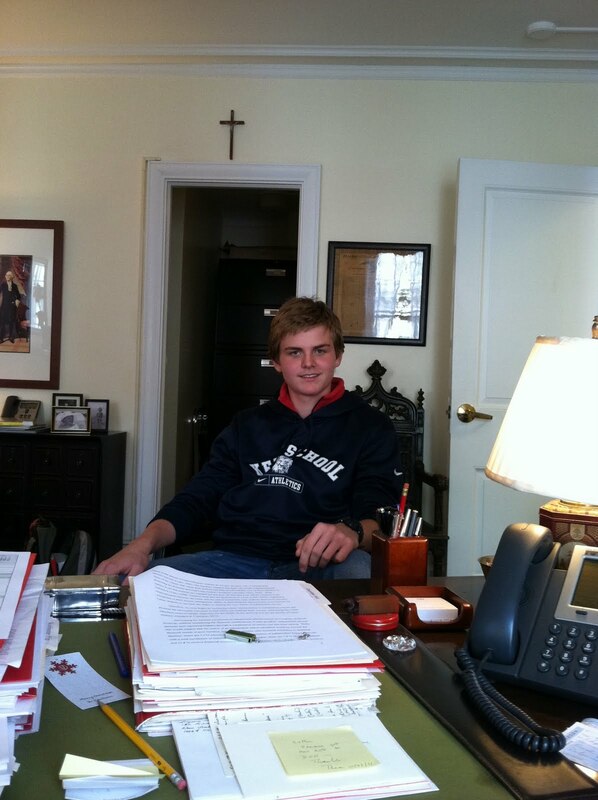 Attending boarding school comes with some advantages, one of which is often longer holidays at times like this. 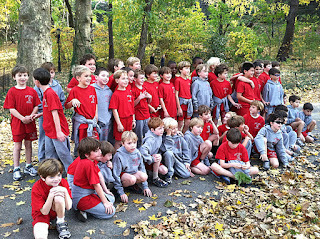 The boys' schools are closed for Thanksgiving. Young Alumni Chapel and Dinner is tonight--a homecoming where high school aged alums attend Chapel and break bread with our 8th graders. Over dinner, they will discuss the schools they are attending and share tips and pointers with the 8th grade boys who are right now going through the application and interview process. 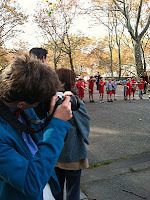 Tomorrow is one of our school's longest standing traditions--The Odds and Evens Soccer Game. Alums from the even years play the alums from odd years in a spirited game. Typically, alums as far back as the early 70s and as recently as last year play. Many older alums also come to watch, feeling more confident enjoying the game from the sideline, rather than playing it. It's even closer to Thanksgiving! I know, not because of the date, but because of our work at TCC. 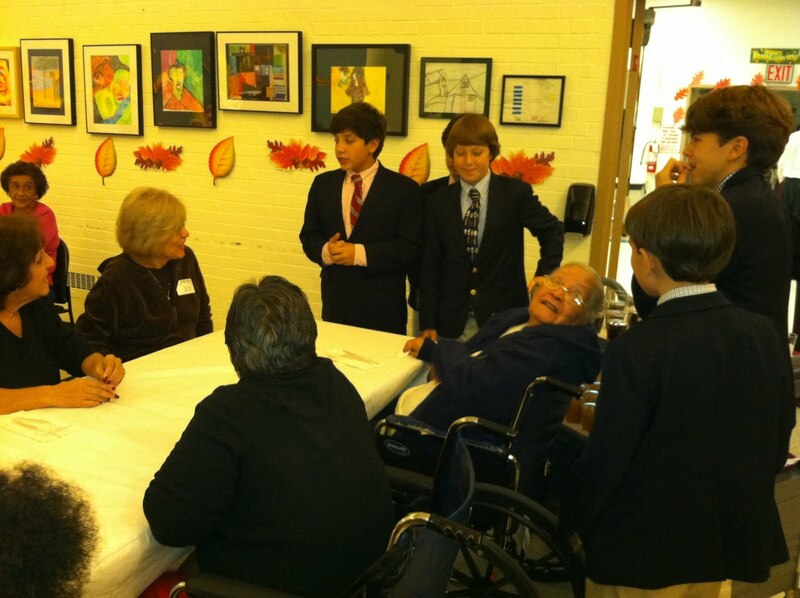 Together with our 6th grade volunteers, we spent this past Tuesday night at Terence Cardinal Cooke nursing home serving residents and their families Thanksgiving Dinner. 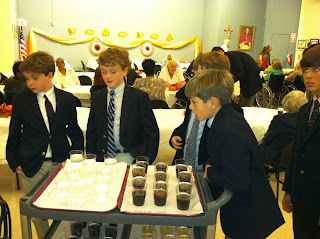 As always, the boys exercised their duties with enthusiasm, sensitivity and care--emblematic of "good men" in action. 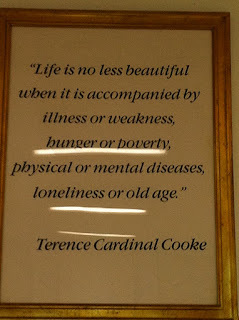 As the parent of a child with multiple disabilities, the statement at right by Cardinal Cooke resonated with me, so much so, that I had to snap a quick shot. 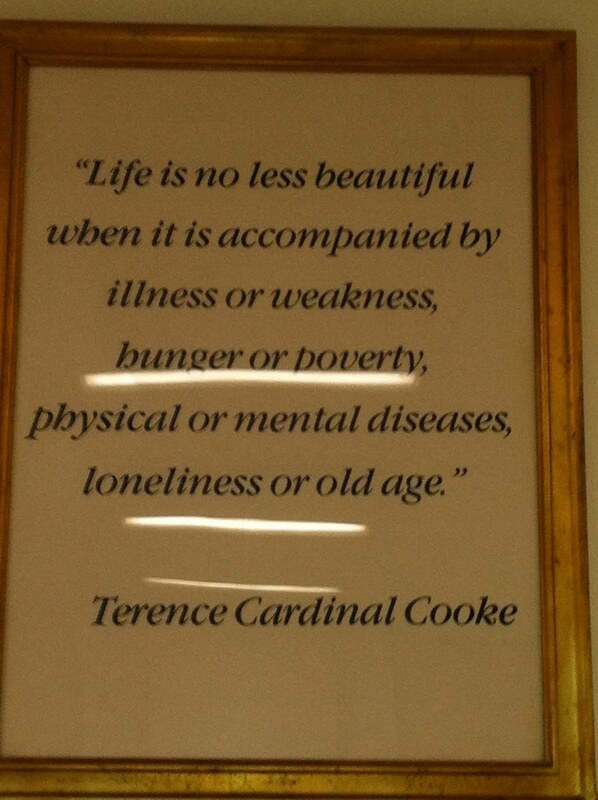 It hangs on the wall of the room we were working in. Attached are several photos of the night. In them, we see the boys serving drinks, preparing food and sharing time with the residents. This coming Saturday night at 6:30, Corby, '12 and his band, The Lead Heads will be performing at The Bitter End in Greenwich Village. Click on the link above for more information, including tickets. If you like The Dead, The Lead Heads will be right up your alley. Our morning began today with a Saint David's Ensemble open rehearsal in Hyman Hall at 7:45 AM. Many weary eyed parents filled the hall and enjoyed the boys playing Reinhold Glière's The Russian Sailors' Dance from his 1927 The Red Poppy ballet. The dance was followed by a little Mozart and finally Henry Mancini's Pink Panther. 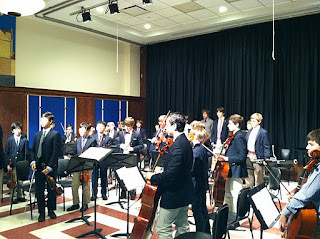 The boys were impressive given the fact that the seasoned core of the orchestra graduated last year. This ensemble has been working together for just a few months. Below is a little slice of Mancini from the boys rehearsal today. We visited alums at Browning on Remembrance/Veteran's Day. Saint David's currently has four alums at Browning, DQ, '09, RH, '10, MD, '10, and BB, '11--a freshman, two sophomores, and a junior. Since 1971 we have had 120 alums matriculate to Browning. Just last week, Browning opened their renovated lower gym. It looks spectacular. The boys were clearly proud of the changes. 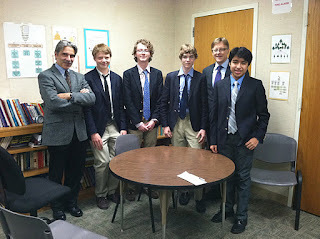 The Saint David's alums all looked great--happy and comfortable in high school. They are enjoying high school, felt very well prepared for the challenges presented, and thoroughly enjoy the flex and free periods--the greater independence. 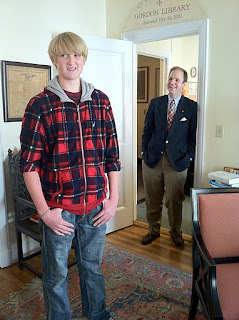 In additon to meeting with the headmaster, Mike and I met with the US head and Admissions Director. ... because we are all talking turkey! Today it was all about the 2nd Grade and their Turkey Run. On an absolutely beautiful fall Monday, the traditional 2nd Grade Turkey Run did not disappoint. All 47 boys finished the 500 meter course with many of them achieving their personal best times. 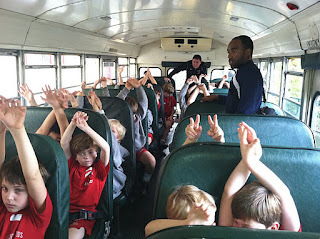 The boys have been preparing and training for this big day with their coaches since the beginning of time--well it seemed like that, but really just since the beginning of school. 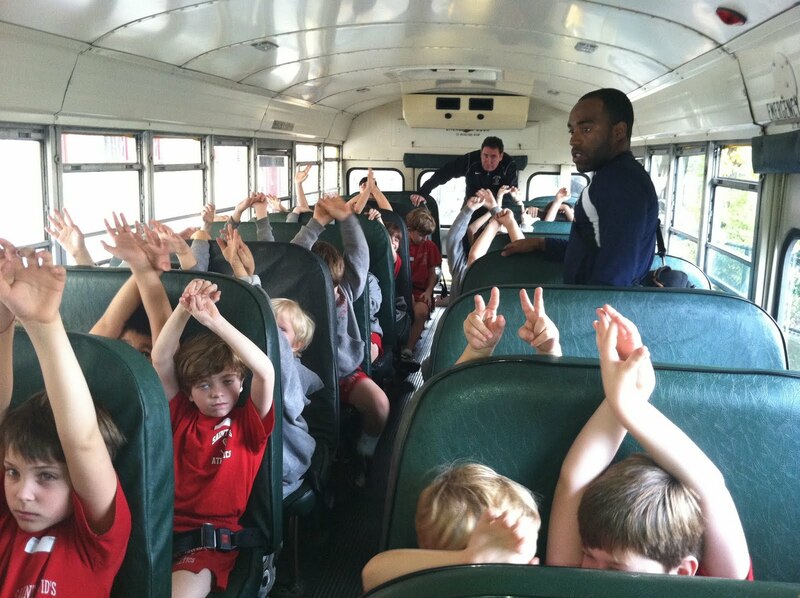 At right we see the boys on the bus ride over to Riverside receiving last minute tips in preparation for the Turkey Run. Nervousness ran high and the air within the confines of the bus was filled with the anxious excitement that precedes all big races such as this. The New York City Marathon has nothing on the Turkey Run. The Verranzano Narrows Bridge may vibrate under the weight of 47,000 runners, but it doesn't even come close to the yellow school bus I was on this morning literally jumping as 47 eight year olds neared the park and the start of their "marathon." At left we see the boys arriving at the park, preparing to go downstairs to the course. Leaving in three packs, the Ferraris, Lamborghinis and Maseratis, the boys ran north along a straightaway, up a steep hill, down a long decline and back along the straightaway to the finish line--making a big 'D'. No coincidence whatsoever! There was a time, back in the 80s when this all began, that the winner did, in fact, receive as a prize the real deal--an actual turkey. Today, the boys all settle for a chocolate one each. 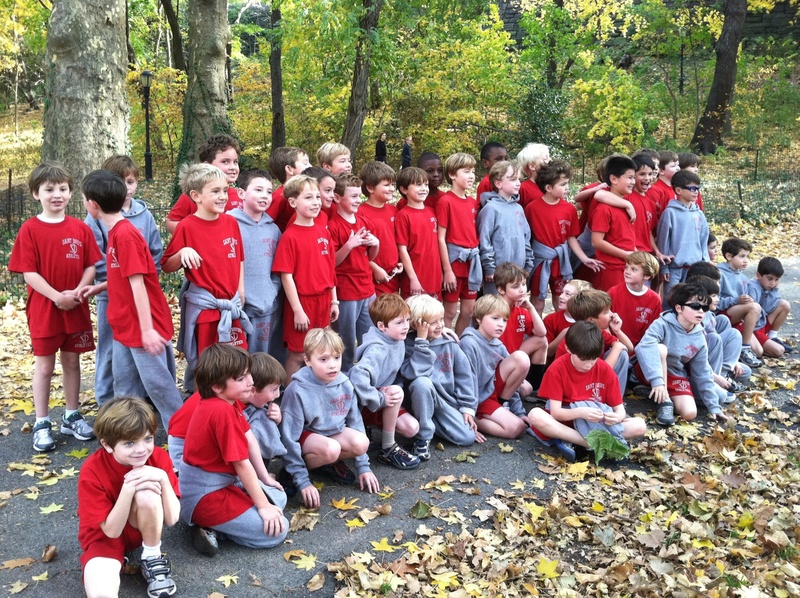 Below is a shot of the boys after the race and before their return to school on the east side. Staff members from the Canticle were on hand interviewing participants, spectators, coaching staff, and of course snapping photographs. 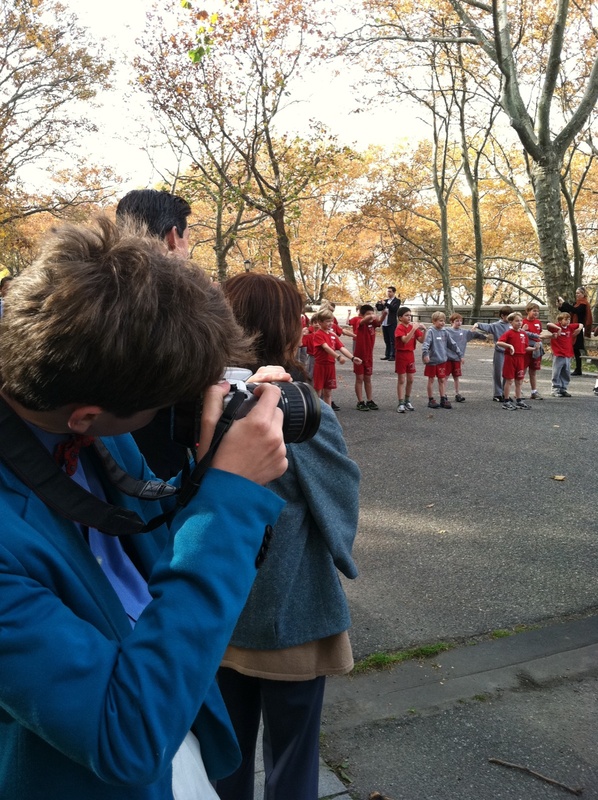 Pictured below are two 8th grade reporters hard at work, snapping away. ... to lighten the day. 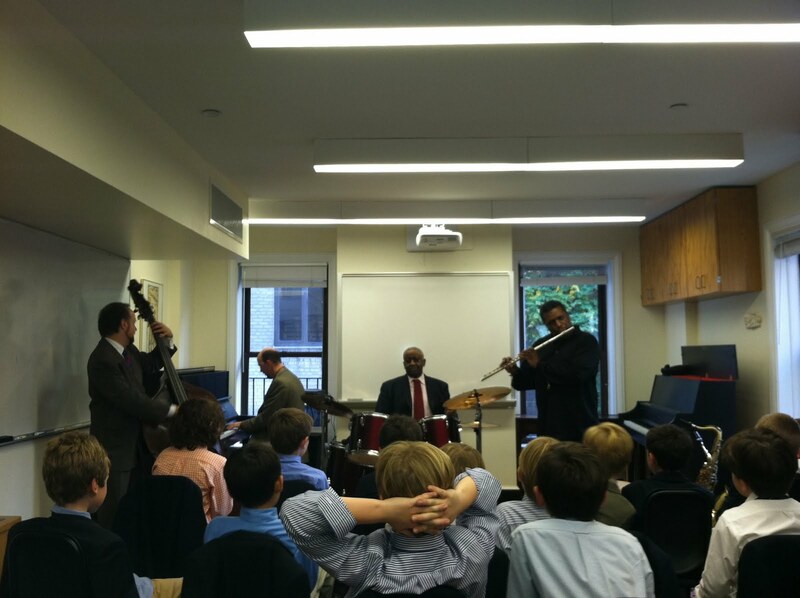 The Lionel Hampton Band dropped by the school today to perform for the boys and answer their questions about jazz, their instruments, how they got started in music, and what it has meant to them in their lives. 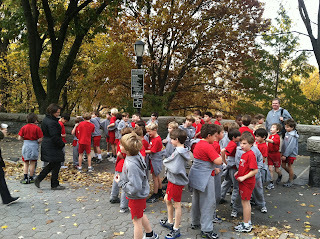 Here, a third grade class listens to a great Dizzy Gillespie number by the band. The boys were most intrigued by the drummer and his quite incredible facial expressions. ... in several Connecticut boarding schools this past week, several alums found their way to Saint David's and my office. Robert A. '11 from Kent visited Monday. 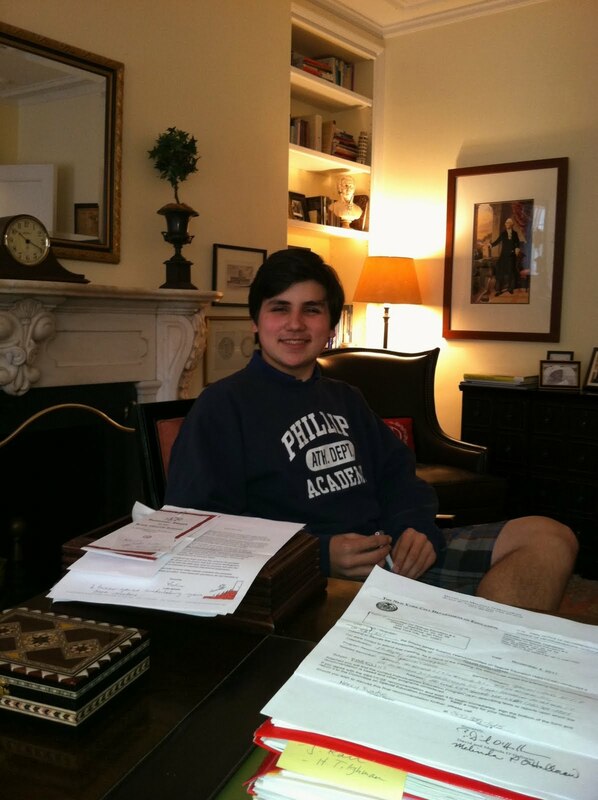 Loving high school, RA is excited about the possibilities of crew, feels well-prepared, but misses his Alma mater. On Tuesday, John D. '11, also dropped by. Enjoying playing starting center for the 9th grade football at Kent, JD has settled in nicely. Pictured with JD, in the background, is another JD -- John Dearie, '95, Alum Director. Connecticut's loss was our gain! On Mohonk Mountain in New Paltz, New York this past week, I participated in a session on leadership literally conducted by Roger Nierenburg. 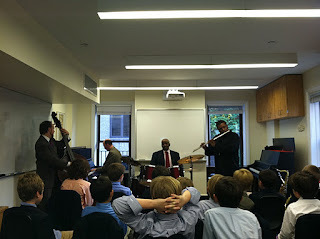 Along with fellow heads of school from Connecticut, New Jersey and New York, I sat "within" an orchestra conducted by Nierenburg and experienced first hand the impact of his leadership styles--for he presented many--on his organization. Using conducting the orchestra, one he had never conducted before, as a metaphor for leadership of a school, Nierenburg explored and exposed a variety of leadership styles--overly eager to please, harsh and expectant, easy, inconsistent, balanced, and their literal respective impacts. It was fascinating to experience the variety of perspectives within the orchestra that each of these styles precipitated--their individual and collective reactions to his "leadership" and the extreme variety of the orchestra's performance outcomes as a result of his leadership.